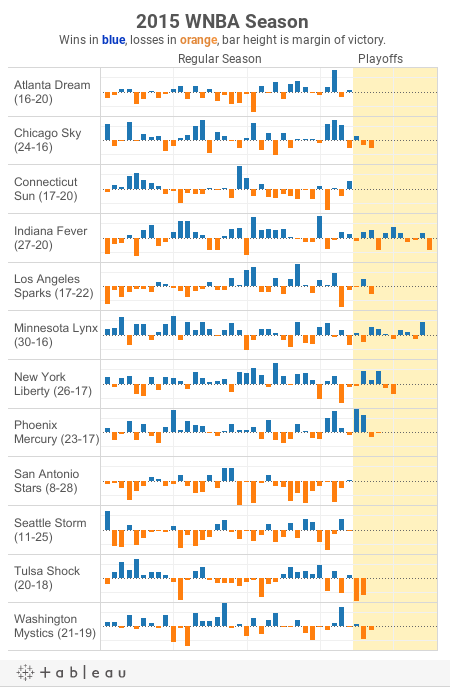 I love using Tableau to publish interactive data visuals, but if you publish Tableau visuals in a workplace, sooner or later you're going to get a request for batch-printing. Tableau will generate a pdf of a dashboard view if you include ".pdf" at the end of the workbook name in the url. Tableau can also receive filter values as url parameters, which will allow the user to customize the view. Andy Kriebel has a nice blog post on url parameters here. Andy's post generates PNG files, but PDF is the same concept. "Time Comparison" doesn't appear in my filter list because it's a parameter. Next, make this pretty by putting the worksheet on a small dashboard with filters showing and the URL list hidden. Next, we use the getSummaryData() function to get the urls and reshape the data array. This command will be called in our html from a button click (below), after the user has made their selection in the Tableau visual. The last function in the above code, downloadAll() has not been defined. This function loops through the urls and downloads each pdf. I adapted downloadAll() from this code. Unfortunately this code only works in Chrome; other browsers will just show a single PDF. Here's the code in action below. The files might take a few seconds to download because the Tableau Public server has to generate each one. A great next step for this project is to get the multiple file download to work in browsers other than Chrome. Let me know in the comments if you use this code, or let me know on twitter. Inman Park has several homes built before 1900, but the two most common decades are the 1920's and the 2000's. Scroll down for an interactive version with hover-over (best on a computer). The next visual shows median home age by neighborhood. The oldest Atlanta neighborhoods are near downtown. 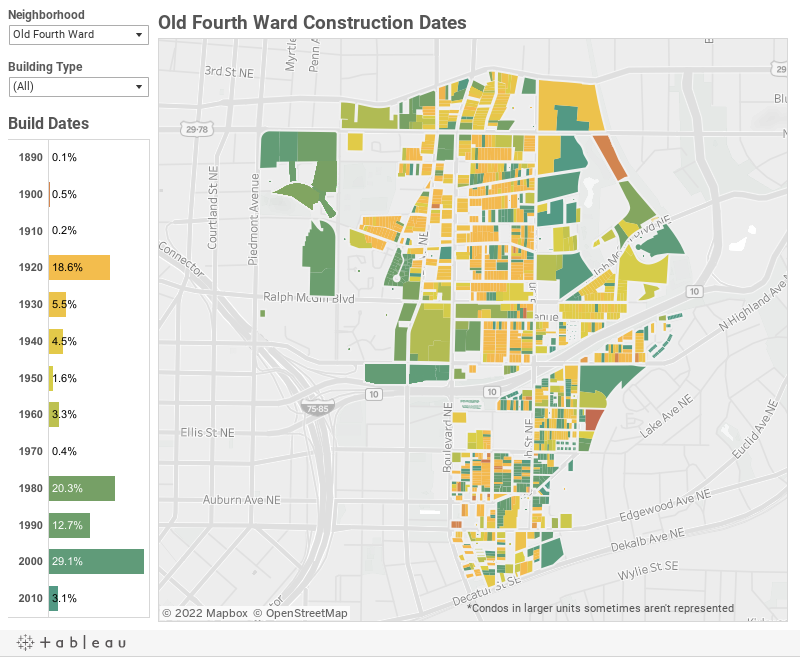 These neighborhoods include Inman Park, Midtown, Adair Park, and Grant Park, all of which have a median home age of 1920. The visual also allows the user to add condos and town-homes to the median age, which changes the age significantly for some neighborhoods. Unfortunately, the ages of homes built in the 1960's or earlier are only approximate. The graph below shows that home ages in the county data tend to be rounded to the nearest five or ten years. 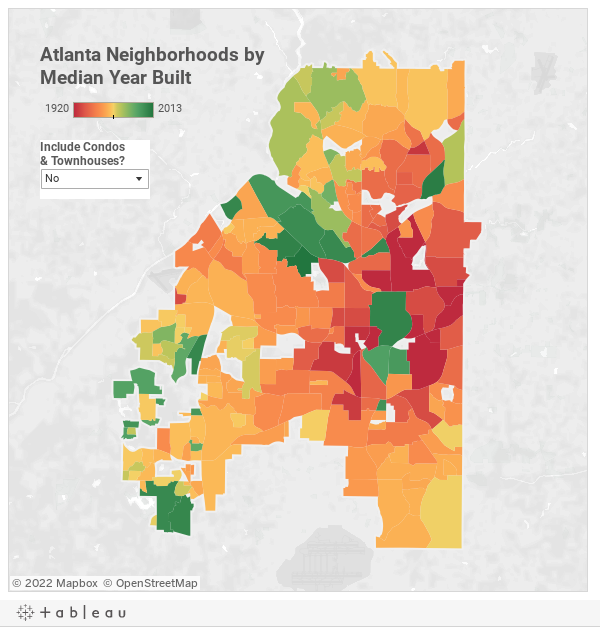 To view a map of home ages for any Atlanta neighborhood in Fulton County, use the interactive below. Mouse over a parcel to see more details or use the zoom tools in the upper left. Dekalb County does not have similar data files publicly available. 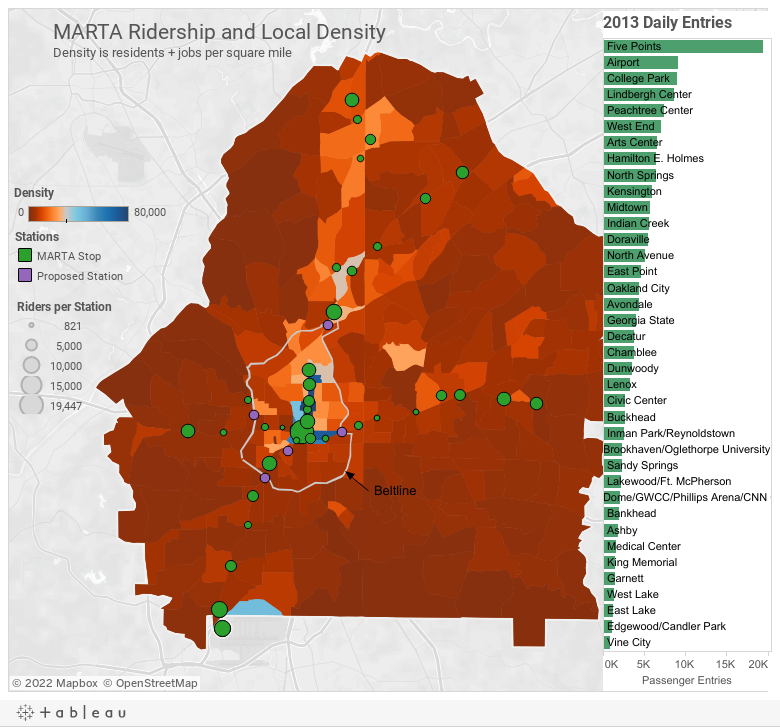 City of Atlanta has a parcel shapefile that includes Dekalb county, but the data is a few years old and has limited fields. Both counties have very functional interactive GIS maps online (Fulton, Dekalb), and property lookups (Fulton, Dekalb). The modal appraisal value is $500-600K, but there are a few homes appraised at over $2 million. Cross-checking with Zillow shows that homes in Morningside/Lenox tend to be listed for about 20% more than their appraisal value. Morningside/Lenox is actually a little larger to the east than the above map portrays, but that portion is in Dekalb County. 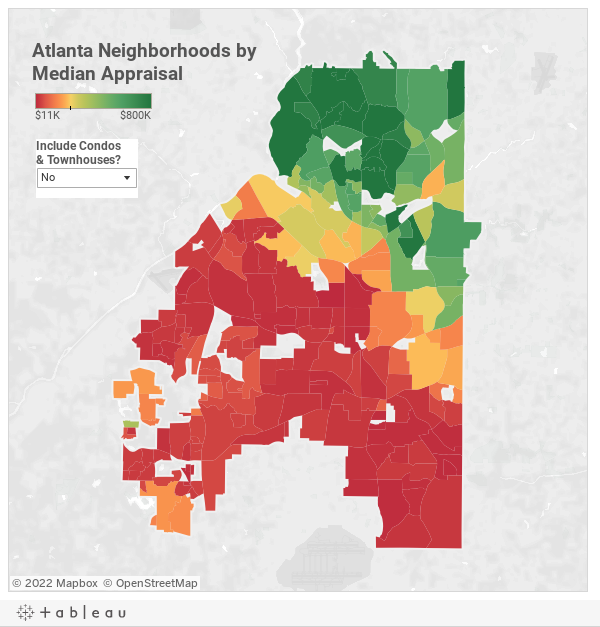 Use the interactive tool below to view appraisal data for any Atlanta neighborhood in Fulton County. 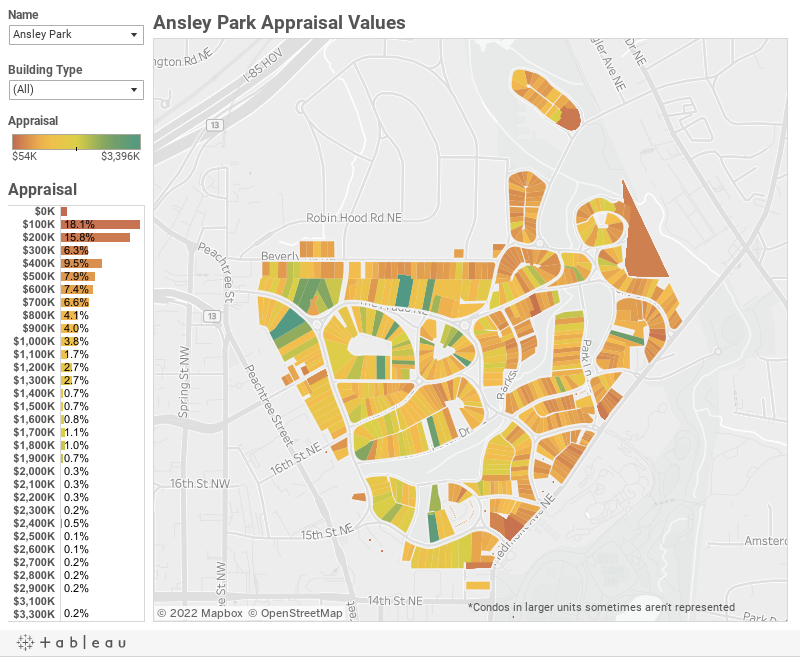 We can also view average appraisal value by neighborhood on the map below. I've made a similar map using Zillow data, but the map using appraisals covers more neighborhoods and includes values of all homes. On the other hand, appraisal values are often lower than actual sale prices. The map above also allows the user to add condos and town-homes. 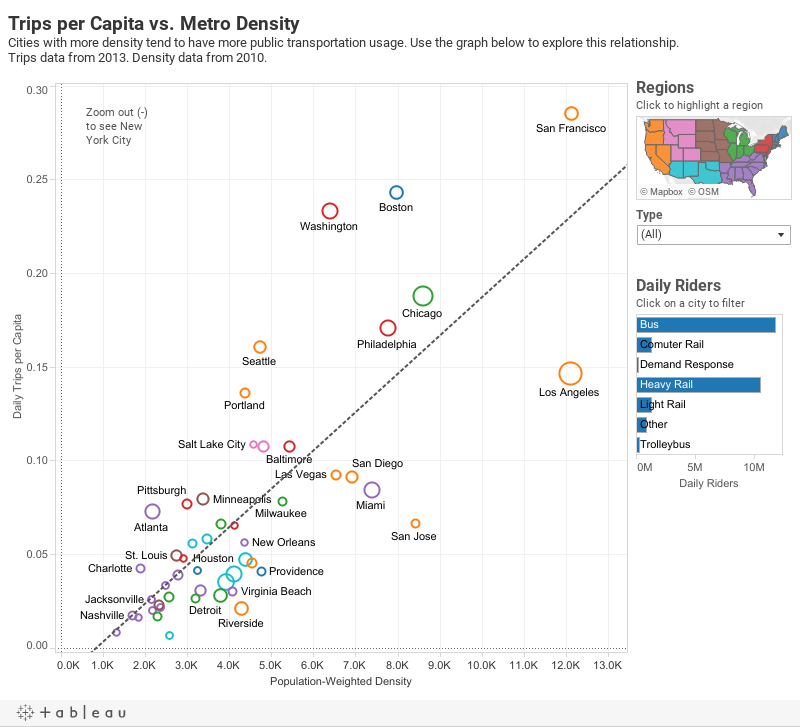 This feature demonstrates the importance of density for affordability. When condos and town homes are excluded, Midtown contains 752 homes with a median value of $498K. When condos and town homes are included, Midtown contains 8,920 homes with a median value of $207K. Let me know in the comments or on twitter if you have questions or find anything interesting in the data. BTW, there's a great resource for researching your property's history here. You aren't going to find historical plat records, the best you can do is the old Sanborn Fire Insurance maps. Those will at least show you the shape of the building. There are some other great historic city maps here. The City of Atlanta recently released their proposed Fiscal Year 2017 budget. 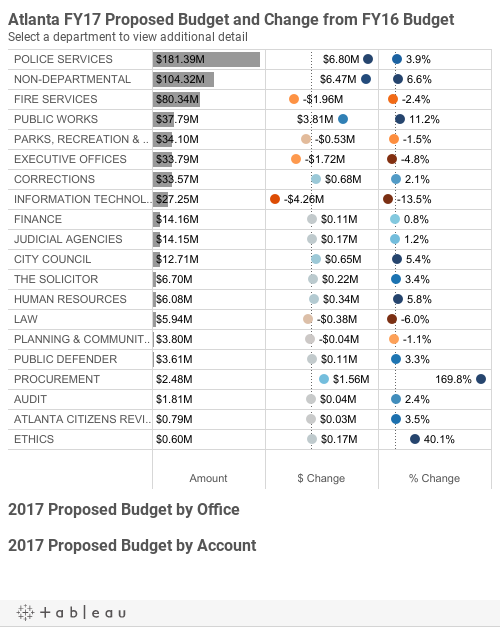 The city provides a 640-page document explaining the budget, as well as interactive data visuals in the Atlanta Budget Explorer (ABE). I was part of the team that created ABE in 2014 after we built a prototype in a city hackathon. To supplement the information in ABE this year I created the interactive visuals below to explore the 2017 proposed budget. The first visual shows the 2017 budget by department, and the changes from the 2016 budget in both dollar amounts and as a percentage. The visual is interactive; click a department to view spending by office and account. The data show the police department is the largest city department at $181.39 million, which is a $6.8 million increase from 2016, or 3.9%. However, if you click on the police services, you'll see that the budget for uniform patrol has dropped by 1.5% (closer to 3% in real terms, assuming inflation). The Account drill-down shows that total salaries for sworn officers is increasing by 2.1%, so the decline in uniform patrol spending does not indicate a decline in the total number of officers. The budget book (p. 75) confirms there is not a decline in staff. The largest increase in the police department is $6.29 million for "SSP Administration". Consulting the budget book (p. 351), I can see that "SSP" is the "Strategy and Special Projects Division". However, it is unclear to me whether the SSP increase is new spending, or just a re-organization of existing services (perhaps out of uniform patrol, explaining the decrease). 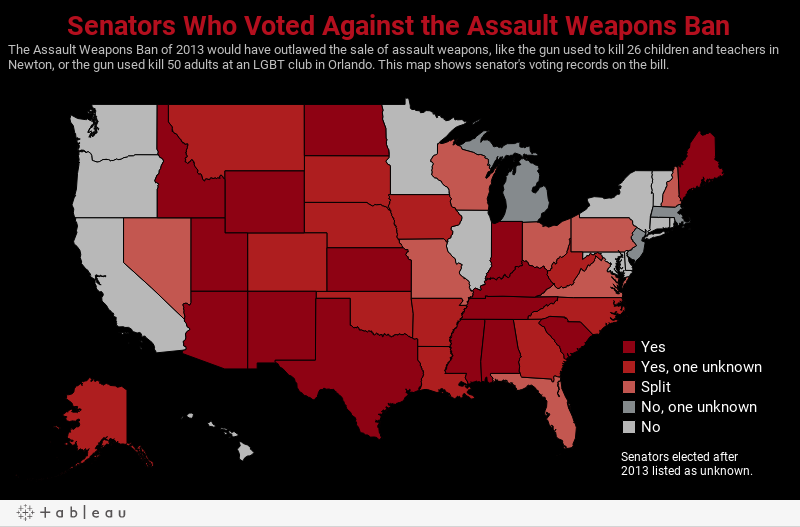 This is a good example of the breadth and limitations of the budget data used to create the visuals. As one might expect, the budget data set does not have detailed department descriptions or narratives. Therefore, the budget book is a useful compliment. For more detail, you can attend the public hearing on May 12 or email the city council. The next visual shows budget changes by department over time. This visual is also interactive by clicking a department. 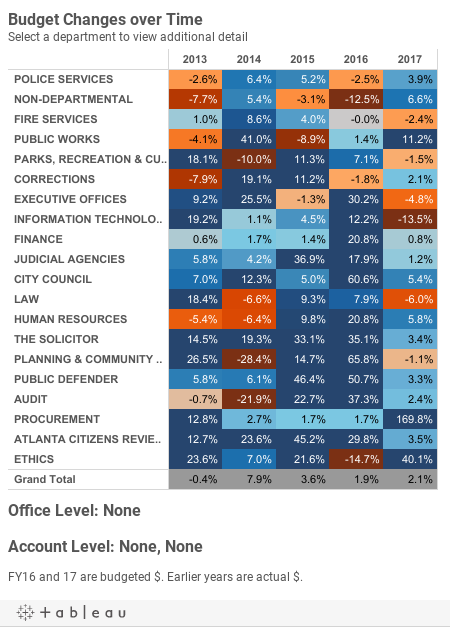 This view shows which departments have been consistently growing, such as city council, whose budget rose from $6.37 million in 2013 to a proposed $12.71 million in 2017. 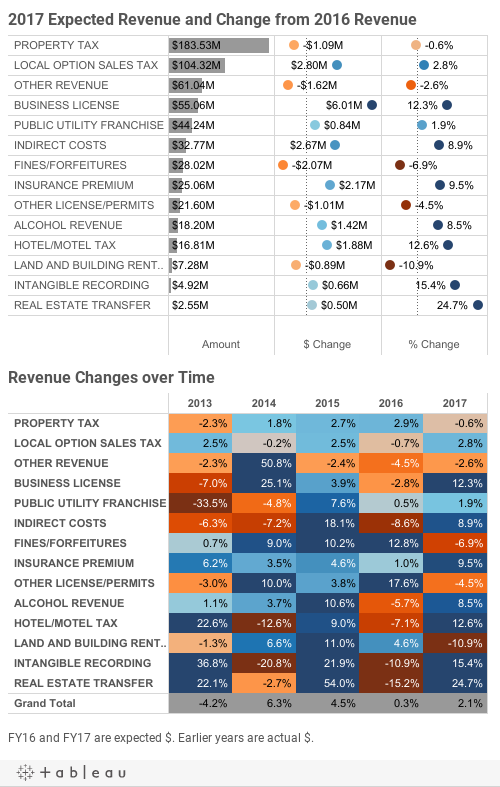 The last visual shows revenue, both the 2017 amounts and the multi-year changes. Property tax is the largest source of city revenue, but the visual shows the city raises money in several different ways. Property tax revenue is projected to fall this year, despite the city's growth. 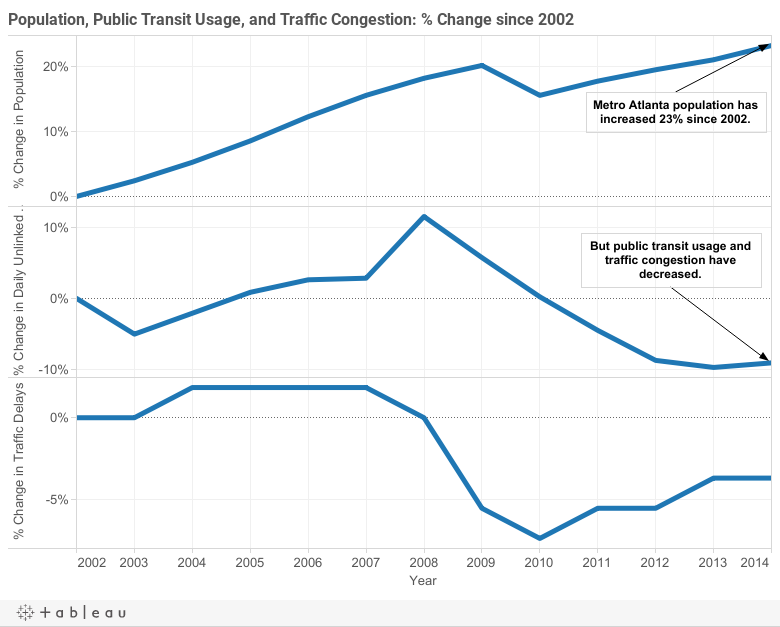 This is because some of the city's new construction falls in Tax Allocation Districts and due to roll-backs from the Georgia Taxpayer Bill of Rights. The visuals above only show budget and revenue from the city's general fund. Both ABE and the budget book have more details on other funds, such as special revenue. Of course the budget data and budget book don't answer every question about the budget (and can't be expected to do so), but both the level of detail and the accessibility of the information are impressive. Update: Councilman Alex Wan has a nice Youtube video encouraging engagement in the budget process.